Our Tiny Home has been sold and a celebration was hosted by The Centre for Skills Development & Training on Saturday November 24. See the video below from the event. The story below was first published in January 2018. The Centre for Skills Development & Training, and the Rotary Club of Oakville Trafalgar have launched a new Tiny Homes program to benefit disadvantaged communities, workers, and the environment. Tiny home communities are proving to be a viable affordable housing solution in many parts of the world. In Canada, the tiny house movement addresses several pressing social issues: access to affordable housing, environmental impact, and now, thanks to the new innovative Tiny Homes program from The Centre for Skills Development & Training, even th employment skills gap. The new program, launched in partnership with the Rotary Club of Oakville Trafalgar, will provide program participants with valuable new employment skills, while minimizing the waste-to-landfill and carbon emissions created during the training process. In addition, the fully weatherized, CSA approved, all-season tiny homes built by The Centre will, upon completion, be dispatched to disadvantaged and indigenous communities around the country, or soldwith the proceeds being used for a range of other good charitable causes. "We really feel that this program addresses multiple issues now affecting communities around the country" said Rotary Club executive Lauri Asikainen. "Not only will it provide valuable skills training for students, but the homes they create have tremendous value, not just as social housing, but as green living spaces, or for people downsizing, adventure traveling, vacationing, or just trying to lead a simpler life." According to Senior Program Coordinator Ellen Faraday, this new program will also make good use of The Centre's resources, reducing the construction training program's waste-to-landfill and carbon emissions. "Before the Tiny Homes initiative, students in our residential construction program would build partial walls or mock houses that would need to be torn down and sent to landfill at the end of each course. Now, these walls will be combined and mounted on a mobile platform to create a modular, movable, permanent home for someone in need." Without the help of the Rotary Club of Oakville Trafalgar, GEM Windows and Doors, Tukstra Lumber and Rush Trailers, this program never would have gotten off the ground", said The Centre's Manager of Marketing & Communications Dean Lorenz. "We're privileged to have these amazing partners involved and that they saw the same potential in this program that we did. It really is a win-win for we everybody". Above members of The Centre receive the cheque for $10,000 presented by the Rotary Club of Oakville Trafalgar at the Tiny Home Inauguration. 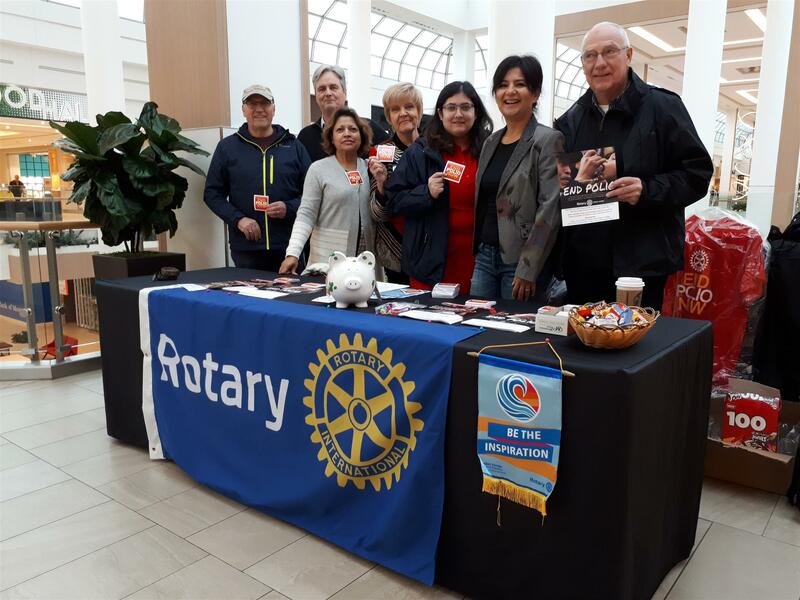 On October 27 the Oakville Rotaractors, along with members of the Oakville Clubs (including the new Passport Club) staffed a table at Oakville Place mall to inform the public about the fight to end polio. In recognition of World Polio Day the three Oakville Rotary clubs organized a raising of the Rotary flag at Town Hall yesterday. 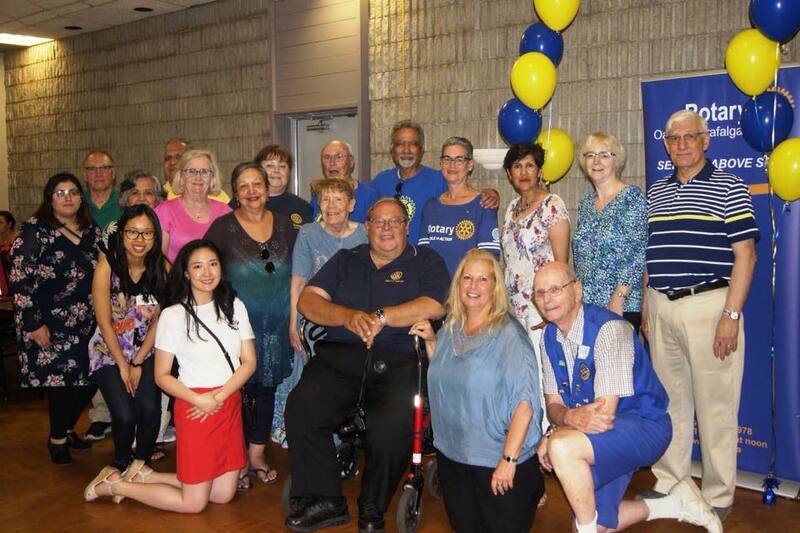 Oakville Mayor Rob Burton and Regional Town Councillor Jeff Knoll (who is a Rotarian) and well as members from the 3 clubs were in attendance. Canadian authors Craig Davidson, Amy Jones, Trevor Cole attend the Wines and Lines panel discussion with moderator and Member of Parliament Pam Damoff at the annual fundraising event held on October 11. Craig Davidson is the author of The Saturday Night Ghost Club. Amy Jones is the author of We`re All in this Together. Trevor Cole is the author of the Whisky King. The 30th annual Strawberry Social event was a real hit with all our guests. Over 160 seniors and their care givers congregated at the Knights of Columbus hall in Oakville this afternoon where they partook of a special Strawberry shortcake. The added scoop of ice cream made it that much special especially on this warm afternoon. The weather gods were with us and all the iced tea and lemonade we got as donations, went down easily on this hot Sunday afternoon. It was delightful see so many seniors hit the dance floor and dance away to tunes from days gone by. Tim Allan, our entertainer has entertained our guests for several years and with sing sheets in hand, many sang along. Our incoming Rotary president, Karen Milner welcomed our guests and our final speaker, the Mayor of Oakville, Rob Burton welcomed our guests and handed them each a pin representing the town of Oakville. That was a nice touch. Some of our guests won raffle prizes and, everyone went home with a goody bag with items donated by two fabulous corporate citizens - Shoppers Drugmart in Oakville Place and Husky Foods in Mississauga. Our cake was donated by Monastery Bakery and the lemonade and iced tea came from Fortino’s on Lakeshore. The beautiful flowers that our guests took home were a gift from Fortino’s on Dundas and our ice cream was donated by Metro on Rebecca. The raffle items were donated by Sobeys on Upper Middle Road and Maple Grove Mall. We handed out special cupcakes to those who celebrated a birthday in the past month and, we have to thank Cupid’s Cupcakes for their generous donation. Every year, all our corporate donors make our event that much special and for this we are truly grateful. Many, many thanks to you and the Rotary Club of Oakville Trafalgar for making the Strawberry Social such a wonderful event. I thought it was a very successful 30th anniversary celebration! Our clients and volunteers all enjoyed themselves and the feedback was very positive. It was great to see that conga line! We at Acclaim Health are very grateful for the partnership we have with your Rotary Club. Your members make everyone feel so welcomed and special. Thank you again for all of your hard work to make this such a successful event. One of the coordinators gave me some stories and feedback that she received and I wanted to share it with you. Dad had so much fun at the social. I was as surprised as you were that he got up to dance but it was amazing to see. I told my Mom and showed her the pictures I took (client and wife amicably divorced) and she was delighted to hear how open he was to meet people and to have fun. It's been so long since we've seen him like this. This is just another way that you (Joanne) have made our lives better and helped me to keep Dad at home with me. My client was so happy to be there and to see me and to see you. Everyone was so happy and she was too shy to dance and me too but I think she might next time. She was so happy she came and her daughter said it was very special that we invited her. She thanked me so much for being her special friend and to taking her to such a special event. She felt much younger in her years again at and after that party. Thank you for inviting me to the social. I wasn't sure how I was going to feel, going without my husband for the first time. Many first times at things without him have been very difficult. Here, everyone was so happy to be there and happy to be with other people and I felt so welcome and so included that there was no room to feel alone. It was a wonderful afternoon and I think it may be a sign that I'm doing okay without (husband) - not perfect, not my old self, but okay - so thank you for that. These are just a few examples of how the Strawberry Social really makes a difference in our clients’ lives. Thank you again for 30 years of support! AND MANY THANKS TO ALL OF OUR CLUB VOLUNTEERS, SOME OF WHOM ARE PICTURED BELOW! On May 24 a large crowd gathered at Le Dome to celebrate the achievement of 33 Oakville high school students. The dinner was hosted by 3 Oakville Rotary clubs - Oakville, Oakville Trafalgar and Oakville West. The award recipients were selected from applicants from eight Oakville high schools. The evening's master of ceremonies was Ralf Soeder (Rotary Oakville) and the key note speaker was one of last year's recipients, Justin Zeus Eden who spoke on the Importance of Thinking Globally and Acting Locally. A highlight of the night was the awarding of The Donna Messer Service Above Self Award to Taliya Rizvi from Garth Webb High School. Below are the 2018 Award Recipients who attended the event. Photographs from the evening can be downloaded from the 2018 Education Awards photo album located in the Photo Album section of the website for Rotary Oakville Trafalgar. The site address is www.rcot.ca. As part of Earth Day 2018, Rotary International President Ian Riseley asked each Rotarian throughout the world to plant one tree! Early on Saturday morning, April 21st members from the three Oakville clubs and families got together at Emily Carr Public School to plant 300 trees supplied by the Town of Oakville. The weather for once was outstanding and it was wonderful to be outside for a good cause.